Arrive at International airport in Delhi. Meet and Transfer to hotel. Overnight stay at selected hotel. 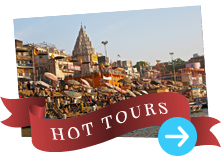 The morning tour of Delhi takes you around Raj Ghat, Red Fort, Jama Masjid (a place of worship for devout Muslims). Then drive down to the "Pink City" of Jaipur and check into the hotel. Overnight stay at hotel. In the morning ride on an elephant back to the imposing Amber Fort then visit the City Palace, Jantar Mantar and Albert Hall Museum. Overnight stay at hotel. Drive down to Agra via Fatehpur Sikri, the former capital of Mughal ruler Akbar. Drive down to Agra, the "City of Taj Mahal". Transfer to Agra Railway Station to take the train for Jhansi. Reception and drive to Orchha for an afternoon tour. Transfer to the hotel for overnight stay. 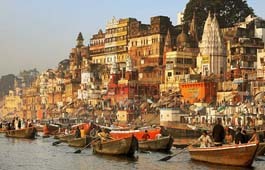 Early morning boat cruise on River Ganges to watch the morning rituals being performed by the devotees to the Sun God. Visit Vishawanath Temple and Durga Temple. Tour of Sarnath, the place where Lord Buddha preached his first sermon at a deer park, then proceed to the airport for the flight to Delhi. Transfer to the hotel and time at leisure. A full day at leisure to shop and visit. Transfer for early security check-in at International Airport.